affiliate and earn that way? Visit Zazzle’s Associate Program page and sign up there. Zazzle’s program is one of the best in the affiliate marketing world. As long as you’re able to get relevant eyeballs to your site / blog, then you’ll be able to earn referral commission. What products do I promote – how do I find them? You use the shortcode option associate_id="238582202591969585", substituting your associate (aka referral) id in place of the example one shown here. Note: If you’re using the free version or the licensed version you purchased has expired, the associate id used will be ours on any new products grids you make. As soon as you purchase a new license version, all old and new links will once again use yours. See the FAQ entry – What happens if my premium license expires? for more on this. Is there an easy way to set up my shortcode? it gives you the shortcode to use. The option choices you make on that page can also be saved for next time (via a bookmark link you’re given). Can I change the styling of the product grid? Yes. 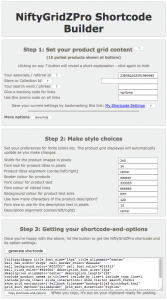 See the complete list of shortcode options, below. How do I change the number of rows and columns in the product grid? The short answer is you don’t. You set the size of the product grid cells and the rows and columns adjust to fill the available width. This means it will display equally well on mobile devices and desktops. Another way of saying it is that the product grid is fully responsive. The cell width, and hence the image size, will reduce if the display isn’t wide enough for the size you set. What are the fallback files for? 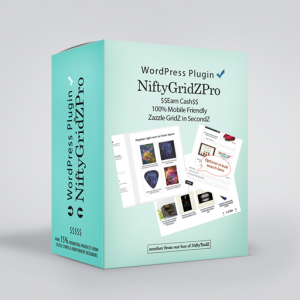 They hold static product grids and are automatically substituted when there’s difficulty ‘pulling’ your live grid from Zazzle. You can use the provided fallback files or make your own with the Nifty Promo Control panel’s code generation (static product grid) option (another tool on our sister site) but note that you’ll need a way to upload the files you generate. See the Intermediate section for more on this. How do I test my chosen fallback file / grid? Remember to remove mimic_zazzle_down=1 after you’re finished testing. What is the full list of shortcode options? Five fallback files are included, with the one above set as the default (a 6-product grid). If you don’t want to give a fallback filename for every grid, just put what you want into the default one. Set interaction mode on or off. When on, by default an inbuilt search form and grid navigation elements are included. IMPORTANT: You can only use one grid per page or post if you’re using interaction. Widgets (as they don’t have an id) can’t use interaction. hide the on-by-default inbuilt search form with show_visitor_search_form=0. eg message_slot_image_alt_text="Click / tap for trending butterfly themed gifts at Zazzle"
for the product grid it’s used in, substitute a visitor’s local Zazzle country domain in place of zazzle.com in all product grid links (and in injected slot messages). It overrides the global setting in your Admin panel for the product grid it’s used in. What are the shortcode option defaults? How does the inbuilt visitor search form work? Here’s a screenshot of the inbuilt form. Note that the form styling is determined by the theme used (twentyfifteen here). 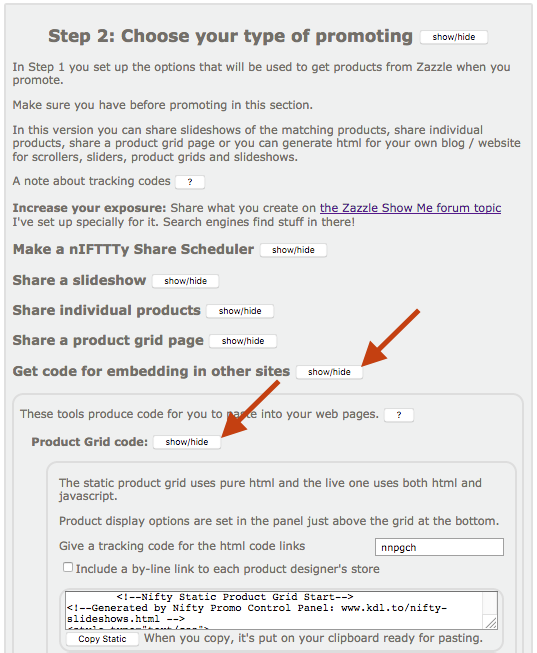 Searches are restricted as per the other options you used in your shortcode (but see Limitations with Zazzle Collections, below). If you’re pulling from a collection, search ignores the collection and the market place is searched instead. This is due to how Zazzle handles collections (see Limitations, below). It’s a case of “Hobson’s Choice”, so there you go. Starting on a positive note, the maximum page size with collections is 240 but before you use such large collections, think of your visitor and their internet connection / data allowance. Even though there are limitations, collections are a great way to go because you can be sure the designs will all go together in some way. This is a great way to get multiple referrals. Note that once a search has been performed when pulling from a collection (remember, it’s searching the market place), the grid navigation elements will be displayed if you have that option switched on. This is where an advert gets injected into a random cell (aka “slot”) in a product grid. A slot message – a home-grown ad with a promotion message, affiliate link or any optionally linked image. The one shown in the screenshot is a slot message promoting version 3.3 of NiftyGridZPro. They’re a type of ad injection and get injected into product grids. They can be promotion messages, affiliate links or pretty much any optionally linked image. The image can be any browser-supported type, including jpg, png, gif. For best results, the image used needs to be 500px wide by 650px tall or thereabouts. You can use square images to make it really stand out. Animated messages: Using a gif image file type allows for animations. A good place to look for ideas is giphy.com. If you want to make your own, it’s really easy, all you need is a bunch of images. Watch this youtube video to find out how. 2mins once you get good! global for every qualifying product grid (see next topic). For best results, the image used needs to be 500px wide by 650px tall or thereabouts. You can use square images to make them really stand out. 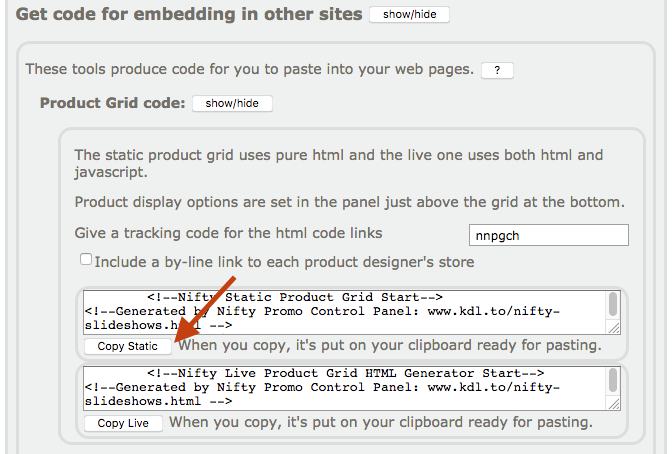 Remember, when you do this for a post’s product grid, the one in its shortcode gets used, not the global slot message. If you never want a slot message displayed in a specific product grid, just put use_message_slot=0 in its shortcode. How do I set up Global Slot Messages? You set up your global slot messages in your admin settings page for NiftyGridZPro. When this feature is switched on, one of them will be displayed on each eligible product grid, right across your site. This means you can reach every visitor with your announcements, seasonal offers, promo campaigns and affiliate links. To qualify for a global slot message, a product grid must have a minimum of four products AND not have its own slot message already (i.e. no mention of slot messages in your shortcode for that grid). Remember, the global slot messages are set up in your Admin Settings page for NiftyGridZPro. If you want to switch off the global one, that’s where you switch it off (but it won’t affect any set up specifically for a post / page). It’s so quick and easy to change the global ones, we feel sure you’ll make them a central part of any promotion campaigns you do. In real time… It’s all about choosing which of the slot messages to display – and doing it in real time. You see, whenever someone visits a post / page of yours with a NiftyGridZPro shortcode, then NiftyGridZPro gets kicked into action to do its stuff. Part of that stuff is checking if Global Slot Messaging is switched on and, if it is – and this grid is eligible for them – then it randomly chooses a message and displays it in a randomly chosen position (slot) in the grid. Think of a lottery draw. Each of the 5 possible global slot messages has its own weighting, a number you give from 1 to 9. That’s the number of its tickets that get thrown into the hat. Once all tickets are in the hat, one is drawn at random. Say you have two global slot messages set up. You give both a weighting of 1. Both get one ticket in the hat, so there’s a 50/50 chance of each being drawn. Say instead, you give a weighting of 1 to the first and 2 to the second. The first gets one ticket in the hat and the second gets two tickets. There’s now a 33% chance the first gets chosen and a 66% chance it’s the second that sees the light of day. How do I inject Google Ads in place of global slot messages? First, you need to put in your Google ad code. You do that using your admin panel, as shown in the screenshot. Ads from other networks should work as well but you may have to experiment. Google ads can be displayed instead of the global slot messages you’ve set up and you choose how often they are. 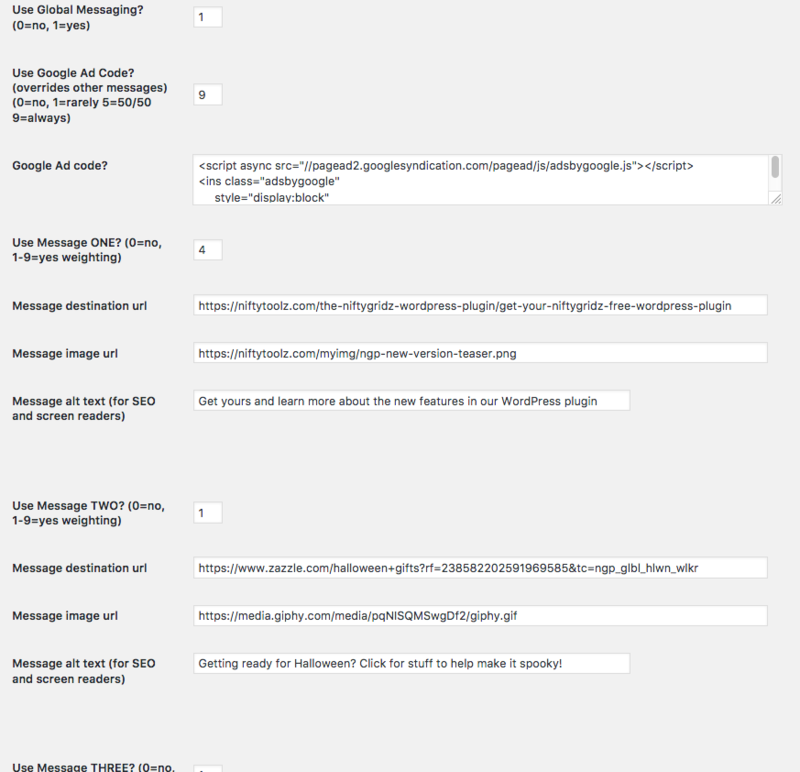 Like global slot messages, they’ll appear in all (eligible) product grids across your site. You choose how often the Google ad gets used by setting the probability it gets chosen. You do that by setting a number from 0 (never), through 5 (around 50/50) and up to 9 (always). Whole numbers only. Let’s get Google’s limitations out of the way first. You have to use Google’s In-feed Ad type as the other types don’t play nicely. You must set your cell size for the product grid to a minimum of 254px as Google won’t show them on widths smaller than 250px (2px are used either side to give spacing between the edge of a cell and its ad content). Once you have your ad code from Google, just paste it into the space provided and choose how frequently it’s to be shown. 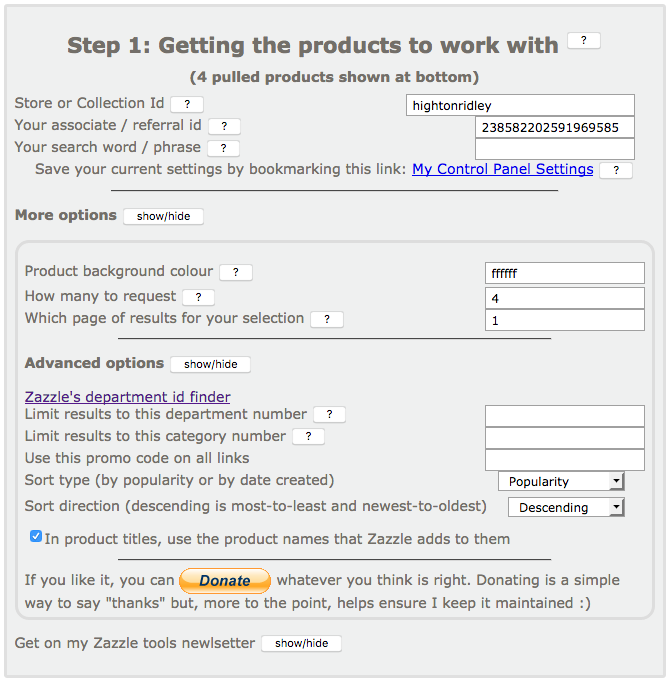 When you click save, it’s applied in real time to all eligible product grids across your site. That last one means you can prevent specific pages/post’s product grids from displaying Google Ads while still allowing display of the other types of message you’ve got set up. Just use use_google_ad_code=0 in your shortcode for the relevent post/page. If you want neither, just switch off slot messages for that page/post’s product grid entirely with use_message_slot=0 – it’s like a “master off switch”. Not wide enough – what happens? Example: If you have your Google Ad weighting set to 5 then there’s a 50% chance the ad will show and a 50% chance it’ll be one of the other global slot messages. Which one? They’ll fight it out amongst themselves based on their weightings compared to the others and the luck of the dice. Ok, it’s totally intended to be used for Google Ads but there’s nothing to stop you putting in your own html in place of the Google Ad code. You’re on your own if you do, just bear in mind the size restriction of grid cells being a minimum of 254px wide. How do I make fallback grid files and where do I put them? Also note that if ever you reinstall NiftyGridZPro, you’ll need to re-upload your fallback files, so keep them somewhere safe! On our sister site there is a tool called the Nifty Promo Control Panel. 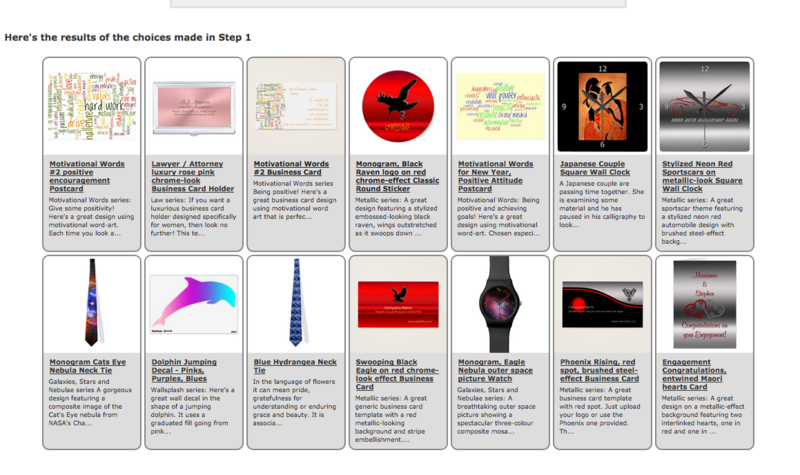 It’s a free tool and has many ways of promoting your (or other’s) Zazzle products. In our case, we’re going to use it to create an html snippet for a fallback product grid. There’s a video at the end of this FAQ topic that walks you through the whole process. First, in Step 1, you fill in the details to get the products you want. When you’re happy, click the “Copy Static” button in the Step 2 area. 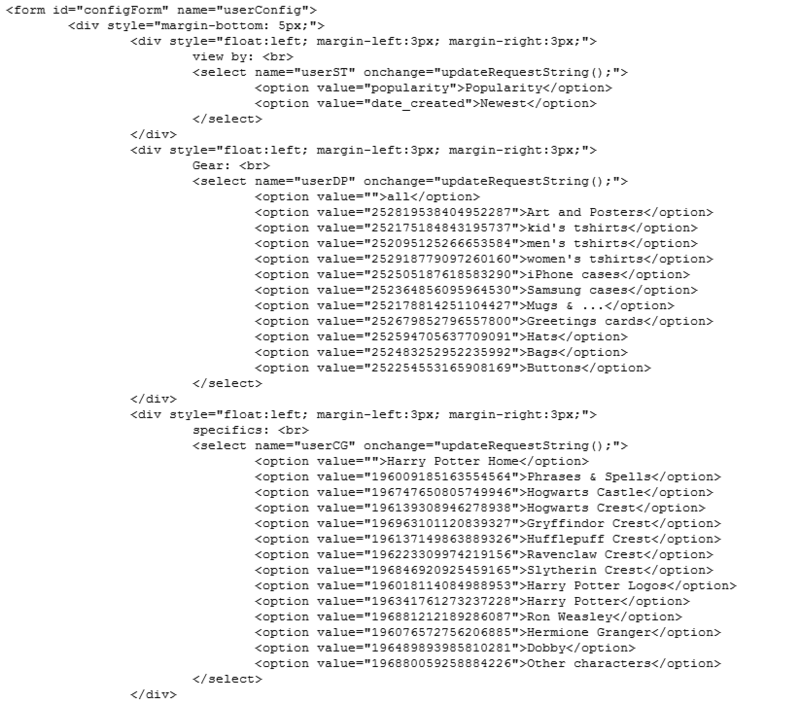 The html code snippet is now on your clipboard ready for pasting. Note that you don’t want the “Copy Live” button because this grid is specifically to be used when Zazzle’s rss feed mechanism is down – i.e. pulling live won’t work. Paste what’s now on your clipboard into a new text file on your computer and save it with an appropriate name. If you’re working in Windows, Notepad is good for this task. On a Mac, TextWrangler is a good choice, TextEdit is a bad choice because if you save it as an html file, TextEdit will change the code – not what you want. Next you upload the file you just created into your fallback folder. The name you give it (say, my-clocks-4grid.html) is the one you use in the shortcode option, like this fallback_filename="my-clocks-4grid.html". This is our hosting provider’s control panel for uploading but you may need to use ftp. If you do, FileZilla is an open source ftp program and works just fine with WordPress. Just make sure you put your file into the fallback folder, as that’s where NiftyGridZPro looks when a fallback grid file is needed. Make as many fallback files as you need to cover your own circumstances. It’s mentioned that to test your chosen fallback grid file, you include a search term in your shortcode option that’s bound to fail. You can turn this to your advantage in the following way. A couple of the options in our sister site’s Nifty Promo Control Panel can be used other than the one for generating product grids. Both are “static” – that is, they don’t pull live when displayed on your site, they’re only pulled live when you first make them. If they did pull live on your site, there’d be nothing to fall back to if Zazzle’s rss feed went down. Interaction mode is all about letting visitors interact with the grid so they can see more of the same or search for different designs / products / occasions. In its simplest form, you can get either or both of grid navigation and a search form. At it’s most sophisticated, you can provide a complete storefront. This mode is available in posts and pages but not widgets. To switch the mode on, use allow_interaction=1. In its simplest use (no coding required) the inbuilt search form lets your visitors search in the same location as your shortcode is set up for. For example, if you set your shortcode up to pull from a department, then a visitor’s search will look in that department. Note that searches will look in the market place if you’re pulling from a collection, due to a limitation at Zazzle’s end. You also get grid navigation controls, grid page number and the number of grid pages at the top and bottom of the product grid so that visitors can browse the different “pages” of the results grid. If you don’t want those elements showing, switch them off with show_grid_navigation=0. For full control, you can switch off the inbuilt search form (with show_visitor_search_form=0) and do everything yourself, with NiftyGridZPro handling the product grid display. This route requires you, at the very least, to be able to modify some code. 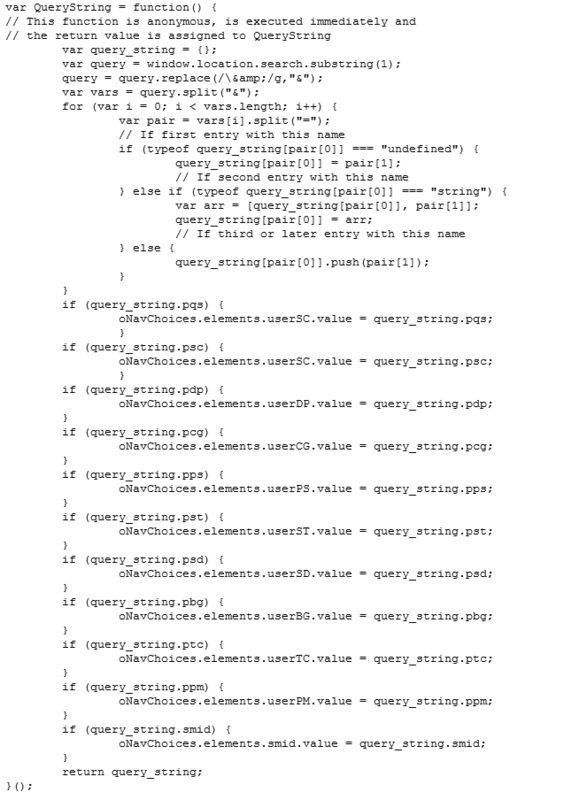 Here’s a sample page implementing a Harry Potter storefront and here’s the code file for it. You can set any of the “pulling” options (and also a promo code) by opening a page (one using NiftyGridZPro) using a bunch of url parameters. http://niftytoolz.com/wp-admin/post.php?post=249&action=edit and you can see the id is 249. Remember, the id makes sure the intended grid responds correctly and is a required parameter. Where a value isn’t provided for a parameter, the shortcode option setting is used instead. If that wasn’t given, then the default gets used. 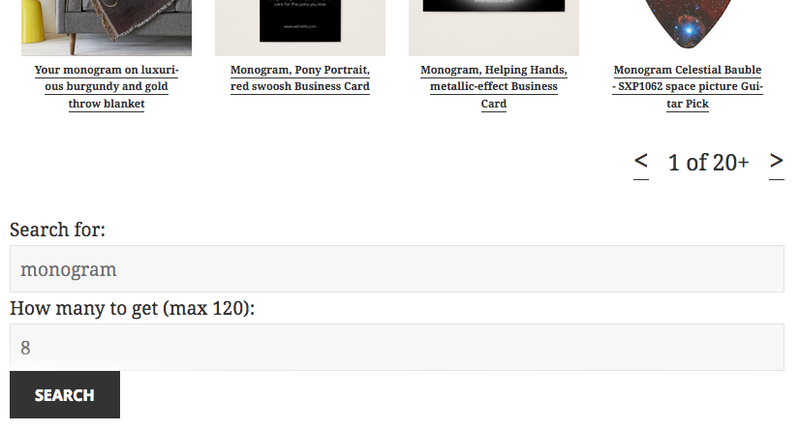 Armed with the above, you can now create an entire store with your own custom page template(s). Here’s a sample page implementing a Harry Potter storefront and here’s the code file for it. How do I create a storefront using NiftyGridZPro? When the page is first visited it might have no url parameters at all – in which case it will display the grid as per your shortcode options. If a visitor navigates around and then bookmarks your page, then the url parameters will also be recorded. This means that when they next visit the bookmark, your page will display the same results as before. There will be some shifting around because of, for example, changes to popularity since their last visit. 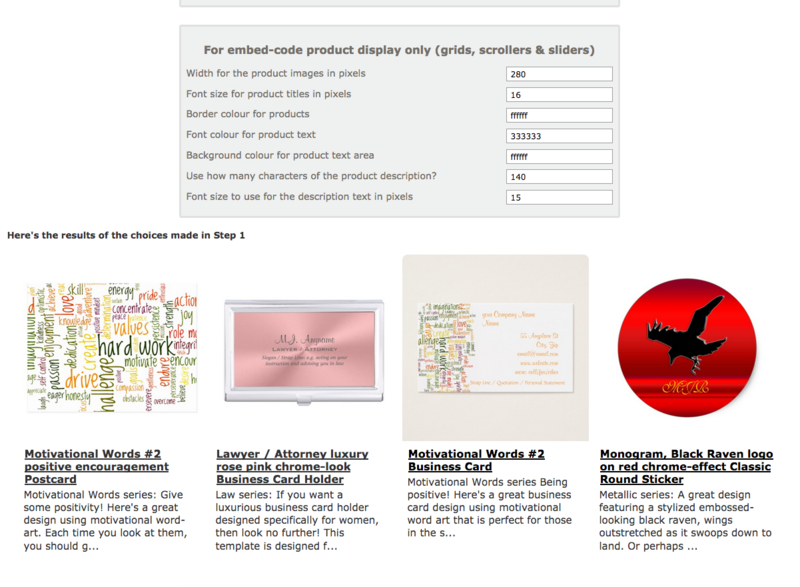 You could have one such template page per major section you want your store divided into, so you can brand each one differently. That way, each could have its own specific graphics and navigation choices. A sports store might use a page each for golf, football, basketball, swimming, gymnastics etc. Here’s an example based on Superheroes and here’s the php code file for it, saved as a text file so you can see it at the link. It used the twentyfifteen theme’s page.php as a starting point as that’s the theme we’re using. where you get the value to use by looking in the address bar while you’re editing the page / post in WordPress. When a visitor interacts with an input, the onchange function is triggered, which builds the new url together with its parameters and then reopens the page with them. This causes the new products to be pulled and displayed. 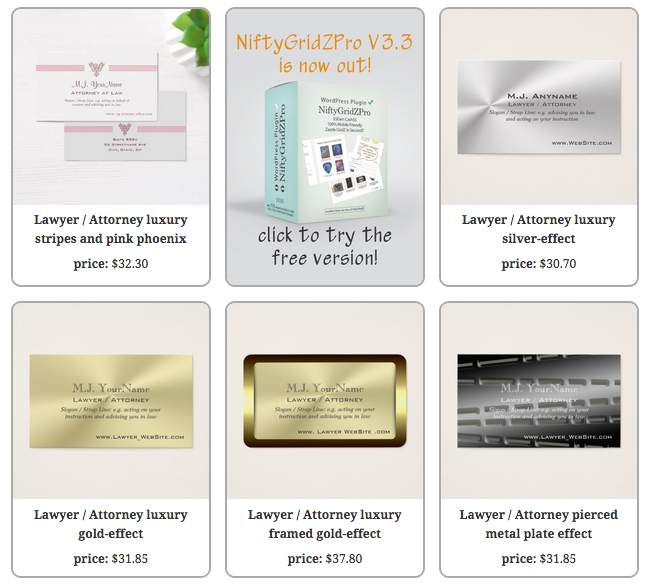 However you can conceive it, NiftyGridZPro has got your back! Can I use more than one grid on a single web page? You can even mix some in interaction mode and some not. You might have one as a widget (remember, no interaction in widget product grids) in your side bar and then interaction mode on a series of blog posts. If you do that, then when someone looks at your blog they’ll see, on one web page, the one in the side bar and some in the blog posts on display on that page. When someone interacts with one of the product grids, the page / post id (smid) allows the right interaction grid to update accordingly. Can I use more than one grid in a single post / page? Well, you could, but in interaction mode they would all respond and end up displaying the same thing if a visitor interacts with any of them. Not what you or they would want. 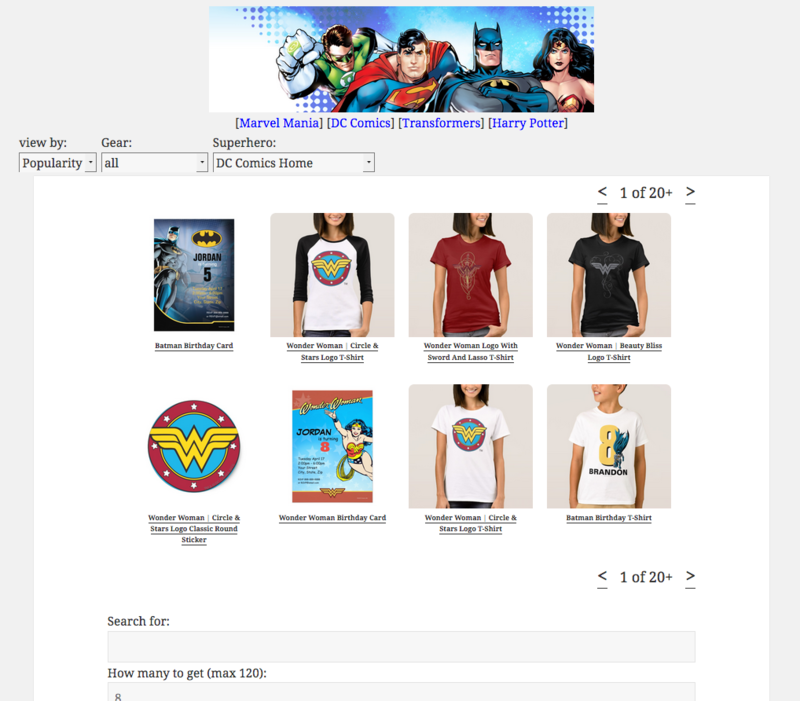 What are local Zazzle domains all about? Zazzle has the equivalent of its main .com site for each major country’s domain and calls them international domains. For example, zazzle.co.uk for the United Kingdom, zazzle.de for both Denmark and Germany, zazzle.co.jp for Japan and so on. Prices are displayed in the local currency. If the official language used isn’t English, then the local one is used. BUT more importantly for us, if someone clicks one of your referral links and gets taken to the .com site but then goes to their local Zazzle domain to buy something – you won’t get the referral commission. It’s a not-so-well-known rule that Zazzle has when it comes to earning referral commission. For this reason we’ve got both a global setting (Admin panel) and a shortcode option (use_local_zsite=1) to swap out the .com in all product links in grids and replace it with the country domain local to the visitor. How does NiftyGridZPro deal with products not available on international domains if they appear in your grids? It does the best thing possible – leaves them alone. Simply excluding them from grids entirely is no good, not for maximum utility. You could end up with completely empty grids under some circumstances. So, a grid might end up including some products linked to your visitor’s local domain and some to the .com site. There’s some other twiddly bits associated with using local domains. Read our detailed blog post about local Zazzle domains to find out about, for example, using price lines and how they’re affected. How do the licensing options work? With a free license, there are no restrictions, it works exactly like a premium license. The only difference is that a free license uses our referral id. This means that if you sell any of your products, you’ll get the royalty but we’ll get any referral commission due. If later you move to a premium license all pre-existing and future links will use your referral id. These are licenses you pay for. They come at various prices for various durations. See the licensinge page for details of the current ones. If you find that you’re not earning enough referral income to make purchasing another license work for you, simply let it expire. See the next FAQ topic for what happens under these circumstances. What happens if my premium license expires? If, for some reason, you find you’re not earning enough referral income from NiftyGridZPro, you can let your premium license expire. Everything will carry on working as usual but it will revert to the free version – and you can still keep creating posts, pages and widgets with it!What’s great about this is you get the best of both worlds. When your premium license expires, you’ll still get any royalty sales and referral commission through existing product grids but any new ones you create will use our referral id. This means we’ll get any referral commission arising from links followed on the new ones (but you’ll still get any royalties due). If you decide later that you want to have another go at earning referrals, like maybe in the run-up to Christmas when peeps are on a buying spree, just pay for one of the premium licenses again. Once more, all your product grids, old and new, will be using your referral id! Isn’t that great? We think this is the fairest approach and fits in with our principles of transparency and trust.